Dale Patterson is the President and CEO of Opportunity International Canada, an organization which provides financial solutions and training to help empower people living in poverty in the developing world, enabling them to transform their lives, their children’s futures and their communities. 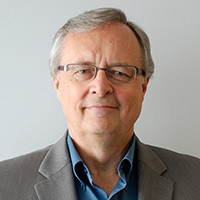 As the President of The Bourton Group, a private marketing, communications and government relations consulting practice, Dale has also held positions as Vice President, International Marketing for UTDC (eventually Bombardier), CEO and Vice President of External Affairs of Genome Canada, Executive Vice President of the Canadian Medical Discoveries Fund, Executive Director of the Retail Venture Capital Association and Founding Chair of the Biotechnology Council of Ontario. He is the former Chairman of the Board of Ryerson University and was also the Chairman of the Ontario Post-Secondary Education Quality Assessment Board, for the Ministry of Training, Colleges and Universities. He was the former Chief of Staff to the Ontario Minister of Industry, Trade and Technology. He serves on private Boards, as well as on the Board of the Ontario Science Centre. Dale and his wife attend St. Paul’s Bloor Street Church, and they have two married daughters and five grandchildren.